The first half of May was extremely busy for both Eric and I. Eric was finishing up his banding job on the Gulf Coast and I was in Ohio running the field trips for the Biggest Week in American Birding. Eric joined me at the Biggest Week for the last few days of the festival and then we both returned home to Indiana to prepare for our Big Day. The Big Day is part of the Amos Butler Audubon Birdathon which is a fundraiser for conservation issues effecting the birds of Indiana. For the last few years, we have been a part of the Wild Birds Unlimited Team and we joined with this group again for the competition this year. After 2 days of scouting, our team started our Big Day at 2 am on Sunday May 18th. We got off to a quick start at Kingsbury FWA where we heard all three of the expected owls, Barred, Eastern Screech, and Great Horned, as well as 12 other species. On our way to Michigan City, we made a quick stop by Striebel Pond to see the American White Pelican that was being seen there. It was a big bonus bird for our Big Day! After a quick predawn stop in Beverly Shores with very few birds, we headed over to Michigan City Harbor. In addition to the resident Peregrine Falcon which was our main target, we also added a couple of bonus birds, Common Merganser and Common Loon. We quickly headed back to Beverly Shores so that we could be there just as the sun was rising. As we had anticipated, this was our best stop of the day! In 2.5 hours, we found 90 species including 23 species of warblers. As we moved west along the lakefront, we found all the expected species as well as a surprise Green-winged Teal at West Beach. 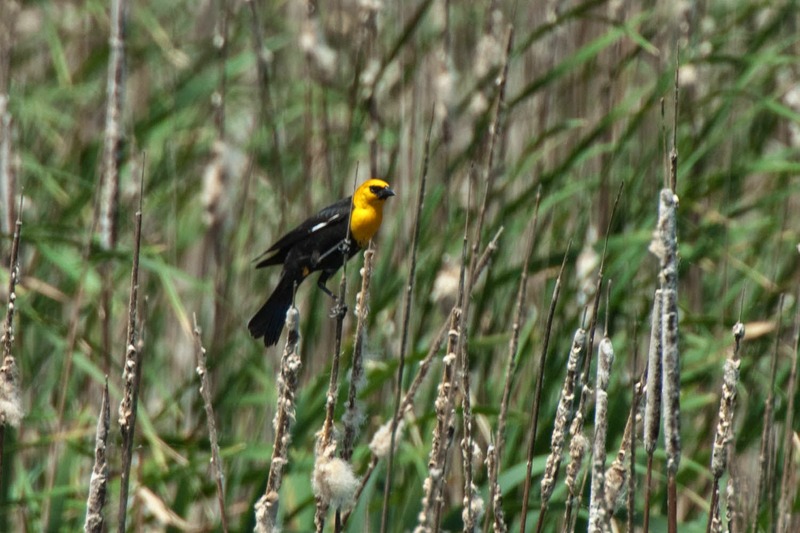 Grant Street Wetland turned out to be an awesome stop with Yellow-headed Blackbird and several species of waterfowl. We made a quick stop at a power station to see Monk Parakeet and then headed south to Kankakee Sands. Yellow-headed Blackbirds are very rare breeding birds in Indiana. 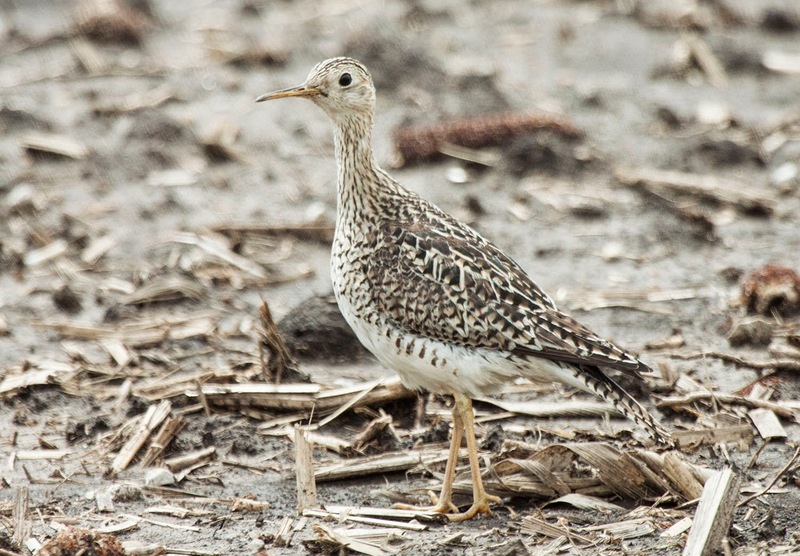 We found all of our targets extremely quickly at Kankakee Sands and moved farther south in search of Western Meadowlark and Upland Sandpiper. We were able to find the meadowlark and add a Vesper Sparrow but the Upland Sandpiper that we saw during scouting the day before was no where to be found. Although this Upland Sandpiper was very cooperative on Saturday, we couldn't find it on Sunday during the competition. In order to get to our next stop, we had a 2.5 hour drive south. Everyone tried to get a little rest during the drive, well, everyone that is except for the driver. We arrived at Owen-Putnam State Forest a little after 5pm and started our hunt for the resident breeding warblers. It took us an hour but we left with all of our target species! 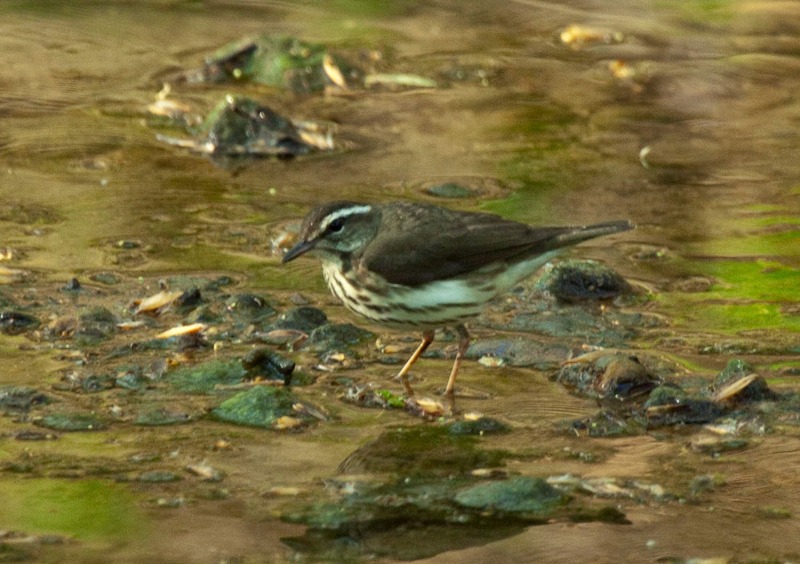 Louisiana Waterthrush was one of the southern warblers that we were able to find at Owen-Putnam State Forest. Although we arrived at Goose Pond behind schedule, we know the area well and we were able to find almost all of the species we were hoping to see. We tried to find a Chuck-will's-widow in Greene-Sullivan State Forest just after dar with no luck so we made our final stop to check on some Barn Owls that we had heard about. That ended up being our final species of the day, giving us a total of 182 species! It was a wonderful day to be out birding and it was very exciting for all of us to learn that we had the high species count for the Birdathon! We came up only 12 species short of breaking the state Big Day record as well. If you would like to make a donation in support of our team, please visit this website. Excuse me but holy crap!!! My best birdathon is 151 and you make that sound easy! Awesome job! Wish I would of been there! Thanks, Ethan! It was a really fun day. 151 is a great total too! This was by far the best total that we have ever achieved.